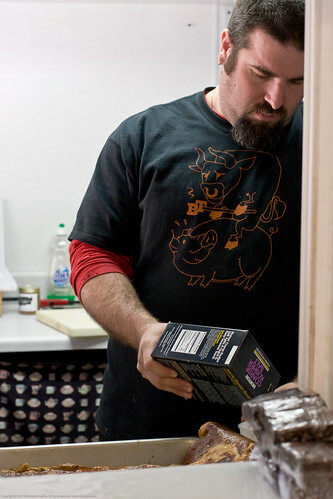 Today I am going to talk a bit again about B.T.’s Smokehouse, a BBQ Mecca of sorts here in central MA run by CIA trained Brian Treitman. For those of you who already travel long miles for Brian’s treats, please note that he is moving into more permanent and larger digs at the Hyland Brewery in Sturbridge, MA (map). Be glad too because this will mean that he can offer even more of the nefarious ideas he has like his own smoked sausages and his award winning chili, amongst other things. I wrote about Brian’s BBQ Adventures (An improbable meat nirvana in a BBQ wasteland) in a previous post after I visited him something like 3 weeks after he had first opened last year. I wanted to give you an update on Brian and the newer things he has been up to. First off, he is still consistently smoking and BBQing heavenly pork butts, pork ribs, beef ribs, beef brisket, chickens, and such. The good news is that now he is also smoking and BBQing up at least three new things that will knock your socks OFF. 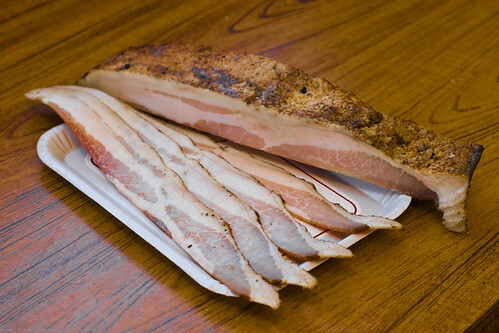 Smoked Brian-made bacon – handcrafted from raw pork bellies. He shared a bit of the process with me on my last visit. This bacon is rubbed and cured with his special rub and curing spices. He then smokes those bellies into a divine slab of goodness. 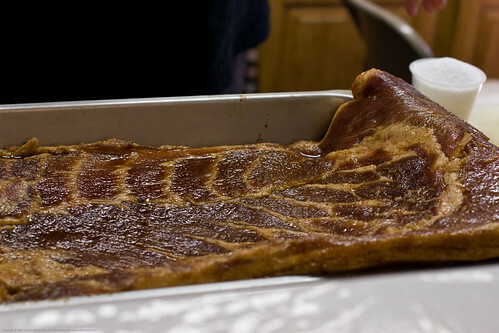 I got to taste some of this bacon and let me assure you, its all about thick slices of smoke and spice that will outshine any eggs you may be eating the bacon with. Secondly, Brian has added what I consider a lethal (to my bank account) offering â€“ smoked hot cured salmon. He has been very careful to not overcook this smoked salmon. When you slice it you can see that it retains some translucence and it is so very moist. The smokiness pairs with an enhanced salmon flavor. My family and I can NOT get enough of this salmon. I could probably sit here and write whole fawning dissertations on this salmon but I think I will simply recommend that you find a way to visit Brian’s B.T. 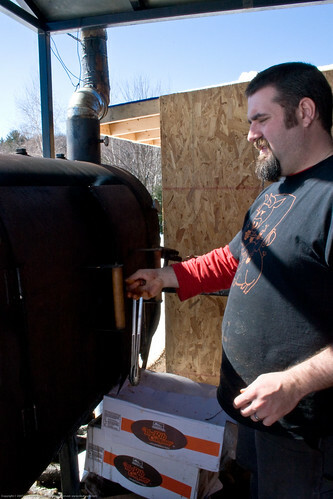 Smokehouse here in Brimfield, MA and later in Sturbridge, MA. 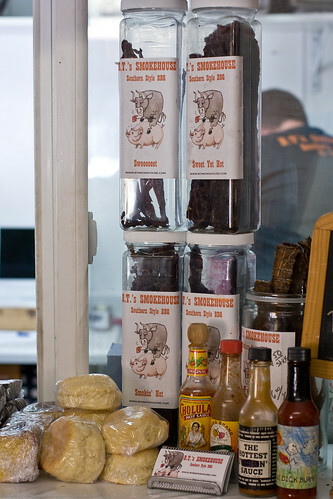 Finally, Brian is now making beef jerky that will satisfy the most truculent of jerky lovers. He does sweet ones, spicy ones, and smoked ones. He goes through a lot of the jerky, salmon, and bacon each week so if you are traveling a long way, be sure to check in with Brian to see when its best to visit. 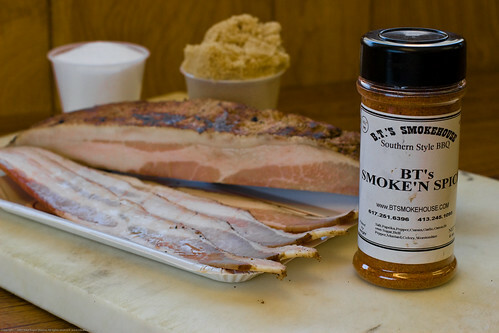 You can visit his site B.T.’s Smokehouse to learn more about Brian and the smokehouse! The only potential drawback of stopping by at his BBQ shack is that your clothes will capture and retain the smoky goodness for a bit. It’s a drawback because it will make you hungry! On my next trip west to South Hadley, I am defiantly making a detour! That salmon looks amazing…Thanks for sharing!